Every summer the women of small town America get something in the mail that fires up their inner Martha Stewarts. A publication so compelling that soon they are flipping through their recipes and rummaging in the back of their craft closets (women in small town America always have craft supplies on hand). Oh, yes, the County Fair Book is full of possibilities to us women of small town America. Why yes, we think, wouldn't it be adorable if I found a yam that looks like Elvis. And, I know that with a little extra fertilizer I can beat Mrs. Johnson's stronghold on tallest sunflower. And so it goes through the sections on best gift basket, photographs, snicker doodles, canned green beans, you name it. Before we know it, we have signed up to bring something in every department. 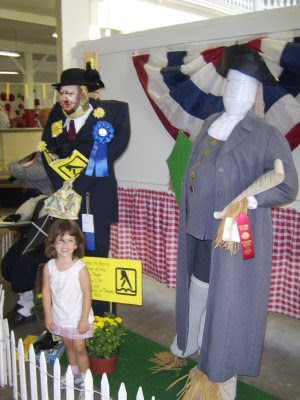 Many times I am able to put the fair book down before committing to anything any more perishable than a few photos and a scarecrow. But this year, I went all out and entered some things I've been meaning to tackle. And I am happy to report that the torch has been passed. Like my mother before me, I am the maker of the best chocolate cake in the county. You understand, that means, from scratch. I had to measure flour. He was beat by my sister-in-law's very clever Yellow Pages inventor. While Franklin did invent the stove that allowed modern cooking, it wasn't until L.M. Berry's invention that small children could actually sit at the table and reach their food. You gotta give him credit for that. 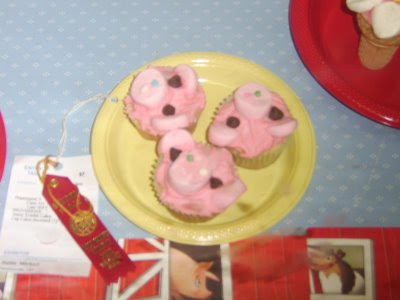 Justin's first fair entry that didn't snort, was, appropriately, pig decorated cupcakes. He was very happy with second place. 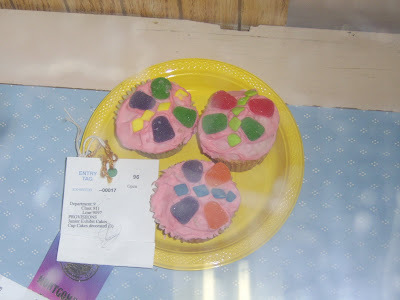 Morgan's cupcakes got the much prettier multi-colored Honorable Mention ribbon, much to her delight. Those are supposed to be butterflies. My decorated Christmas package probably wasn't festive enough, however, it was the only one that featured one-inch mirrors. 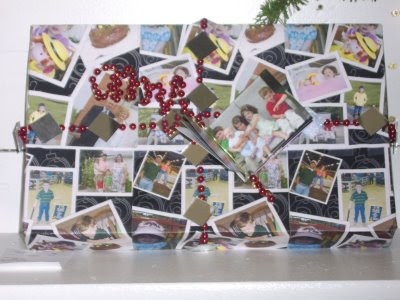 The "wrapping paper" is a printout of a sheet of photos I made, complete with mini-photo book of same photos decorating the top. I should have bought Mom a sweater to put inside. Now I'll have to break in to add her gift. I'm almost ashamed to share my fifth place "ugly cake." 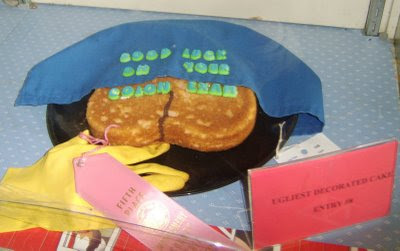 The winners in this category are determined by a vote of fair goers. And since my husband was sweetly stuffing the ballot box at every chance, I can only imagine what it took to get this placing, negative votes? The first place cake featured a green background with two hoof prints, a pile of black goo in the corner and the lettering: Happy Birthday You Old Poop. It's a good thing my mother-in-law let us know of her great dislike for this cake; we had to cancel our order. Mine is supposed to be two cheeks sticking out of a hospital gown (love my chocolate crack?). The cheesy grocery store letters say, "Good Luck on Your Colon Exam" because it's amazing how many letters Happy Birthday and Colonoscopy do NOT share. It's not too early to start thinking about the next fair, so if you think you've got what it takes to challenge the women (and some men) of small town America, then come on over and I'll let you borrow my Fair Book. I'll save you a piece of ugly cake.